The iPad 2’s more powerful processor is similar to a more sophisticated/robust investment methodology in the ETF world. To illustrate this, look no further than oil ETFs. United States Commodity Fund’s ETF, USO, has a simple first generation investment methodology. USO buys the front month oil futures contract and then rolls it near the end of the month into the new front month contract. This one step investment methodology was cutting edge at its launch, just like the original iPad, but has now been improved upon. PowerShare’s DBO ETF brought to market an updated approach to investing in oil through a more sophisticated investment methodology. DBO analyzes all the oil futures contracts available going out 13 months in an effort to select the optimum contract to purchase given market conditions. This flexibility has allowed DBO to distance itself in terms of performance versus USO over the last few years. 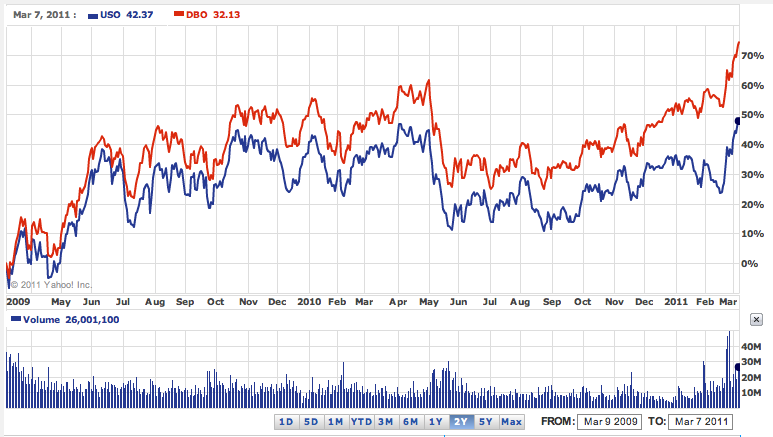 Check out the 2 year performance chart below comparing the first generation oil ETF, USO, to the second generation oil ETF, DBO. Adding cameras to iPad 2 will give the device the ability to assess the world more accurately through images. This concept has been duplicated in the ETF world through the launch of ETFs whose holdings better reflect the investment opportunities in given markets. For a clear example of this, one can take a look at investing in China through ETFs. The largest Chinese ETF is iShares’ FXI. Most investors use this ETF as a proxy for the Chinese equity market. However, many investors haven’t examined the sector concentration of this ETF and don’t know that there are several important sectors with little to no exposure in FXI. 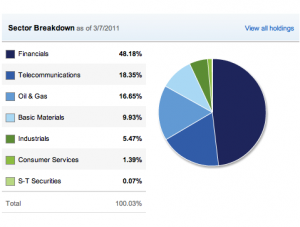 Here’s a pie chart breaking down FXI’s sector exposure from iShares’ website. As you can see, the top three sectors make up 82% of FXI. 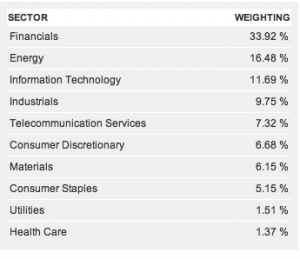 That is a fairly high level of sector concentration for a broad based ETF. In addition FXI has less than 2% exposure to consumer oriented companies, perhaps one of the biggest investment opportunities in China going forward as they build their middle class. Note there is also no exposure to the technology sector, another key area of growth. Enter the second generation China ETF by Guggenheim, YAO. YAO is less concentrated by sector and exposes the investor to a more diverse group of sectors including consumer and technology names. 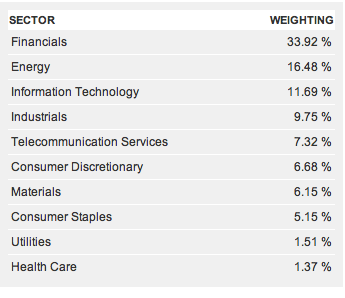 Here’s YAO’s sector breakdown from Guggenheim’s website. Note that six sectors make up about 82% of YAO’s portfolio (vs. FXI at three) and that technology and consumer names make up about 22% of the ETF. Like the new perspectives the camera packing iPad 2 will provide, YAO provides a clearer perspective on the Chinese market opportunities available to ETF investors. Smaller is generally better when it comes to technology and the iPad 2’s 33% slimmer body is an impressive advance. Investors also like smaller when it comes to investment expenses. In ETF land, perhaps the most recent and obvious example of lower expense ratios attracting investors is the battle between the leading gold ETFs, GLD and IAU. GLD is the first and largest gold ETF with over $55 billion in assets. (also the second largest ETF) It charges an expense ratio of 40 bps and is part of the State Street SPDR family of ETFs. 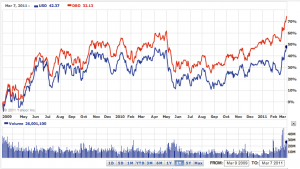 Shortly after the launch of GLD, iShares brought to market their similar gold ETF, IAU. As a second to market ETF, IAU has struggled gathering assets relative to GLD until recently. In July of 2010, IAU cut its expense ratio by about 40% from 40 bps to 25 bps. Since then, IAU has been aggressively adding assets relative to GLD. In fact a recent piece by Index Universe highlighted the four times asset growth rate of IAU over GLD in 2010. Just last month, February 2011, saw $300 million plus of inflows into IAU relative to outflows of $700 million plus from GLD. Keep in mind that GLD is still 10 times the size of IAU so the story here is the emergence of solid inflows into IAU due to expense ratio efficiency, not the demise of GLD. Similarly, a 33% smaller case isn’t likely to generate many iPad to iPad 2 converts but it will help increase the appeal of the iPad 2 to those new to the device. The transition by consumers from the iPad to the iPad 2 will be powered by the appetite for innovation and next generation features. Likewise as the ETF user base and product set matures, there exists countless opportunities for new and existing ETF sponsors and investors to update classic ETFs with sophisticated investment methodologies, more representative underlying holdings and lower expense ratios. This process will continue the eye popping growth of the ETF industry and will make it one of the most interesting asset management areas to follow.